As sharp as a knife and with great psychological insight the author investigates the “we” feeling versus the longing for freedom and individuality. I receive samples of products and ARC of books in exchange for an honest review. All opinions and thoughts are my own. In the Netherlands and Belgium, the Boekenweek (Book Week) is an annual “week” of ten days dedicated to literature. It has been held in March every year since 1932. Events are held across the Netherlands during the Boekenweek, such as book signing sessions, literary festivals, and debates. 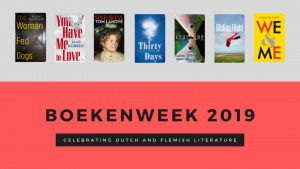 In 2019, Boekenweek takes place from March 23rd to March 31st, and World Editions will be celebrating! 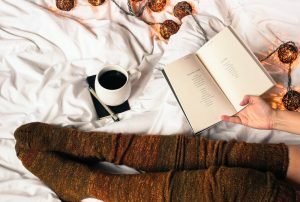 Based in Amsterdam, New York, and London, they publish many Dutch and Belgian authors in translation. 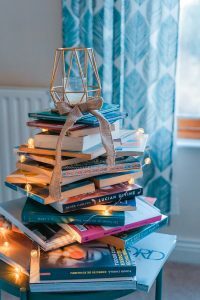 By the time 2019 Boekenweek rolls around, they will have published 8 of the most important contemporary writers from the Netherlands and Belgium. This is a moment to honor the literary output of two entire countries! Neuroses, claustrophobia, scandal and rebellion run rife! This is a truly engrossing book! In this spellbinding novel, which has been compared to the work of Jonathan Franzen, Dave Eggers, and Jeffrey Eugenides, Saskia de Coster provides a uniquely European take on the tradition of The Great American Novel. With the family unit and some of life’s most pressing questions at its center, the award winning We and Me paints a captivatingly haunting picture of bourgeois family life. Very well written,We & Meis a novel that I found to be haunting and unforgettable. 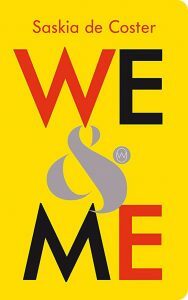 Written from several different perspectives, We & Me covers the time period between 1980-2013 and focuses on the aristocratic Vandersanden family. Set in their opulent private estate located atop a mountain, neuroses, claustrophobia, scandal and rebellion run rife! At the heart of the family and the novel is Sarah, who is coming of age and is daringly and sensitively explored in de Coster’s skillful prose. With her characteristically incisive approach, de Coster excavates the nuanced underbelly of human emotions with humor and understanding and a lightness of touch. Saskia De Coster from Belgium, is a visual artists, playwright and regular participant in television debates, as well as an author. Her seven novels have been translated into over 10 languages. Her work is described as haunting, appealing and unforgettable. Her bestseller We & Me won the Cutting Edge Award, an award she has won three times! She also earned the Opzij Literature Prize, and was nominated for several other prestigious prizes. It has sold more than 40,000 copies in the Netherlands and Belgium alone. Thank you for spending time with me today! 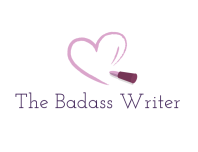 More coming up on The Badass Writer! Please share this book tour on social media and subscribe so you don’t miss a thing!